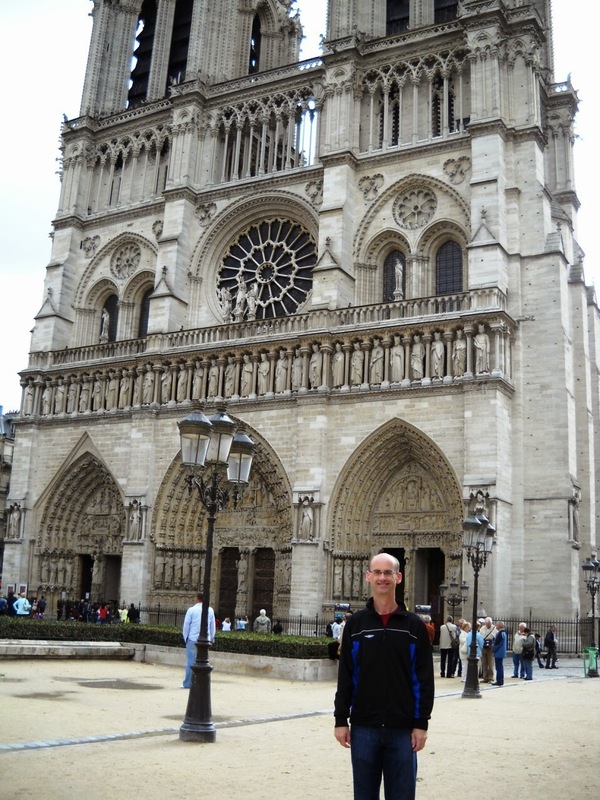 Tonight, in honor of the great Notre Dame Cathedral in Paris, heavily damaged in a tragic accidental fire, I am reposting my original travel blog of Paris, specifically of the day I visited this landmark Cathedral. The article’s wording has not been edited, since its original Blogger posting in 2009. 10:15 AM – After going down to breakfast, I came back to the room to see that the rain clouds had seemingly weakened, and the sun was starting to come out. I quickly finalized my final plans for a big a day of travelling. Today I plan to see all of the biggest icons of Paris in one day – it’s a bit of a stretch whether I can actually make it happen or not, but will definitely try! I took the RER C train to the Saint Michel-Notre Dame station. As I exited, I could see a big crowd was starting to already gather about a block away. I had to cross a small bridge over the Seine river, which was frankly unmemorable, and as I crossed the far end of the bridge, I was actually on Île de la Cité or “Island of the City”. 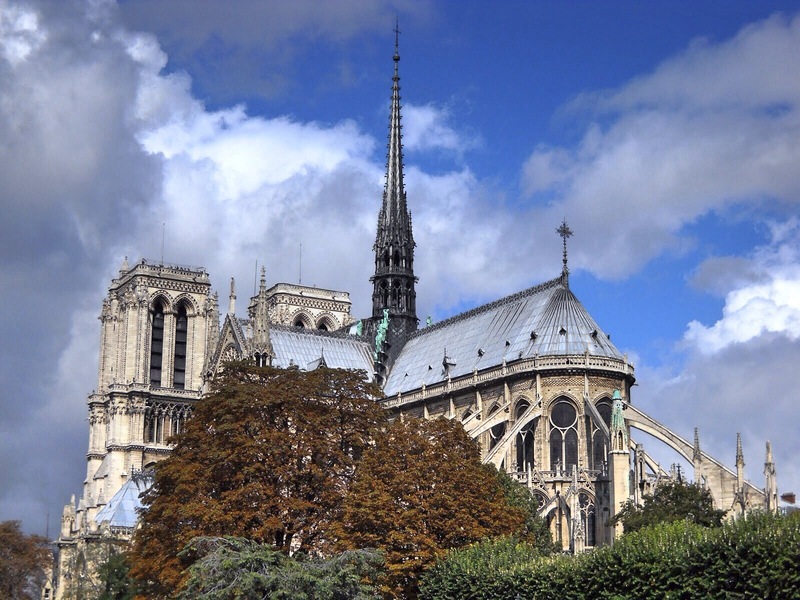 This little area is actually the first site of the 2,000-year-old city of Paris, and right in front of me, in all of its 840-year-old glory, was Notre Dame (“Our Lady”) Cathedral – the seat of the Archbishop of Paris (see picture left, click for larger). This beautiful cathedral, which took over 200 years to build, was just opened a few minutes before, and already seems to have busloads of tourists in its big open courtyard in the front of the building. 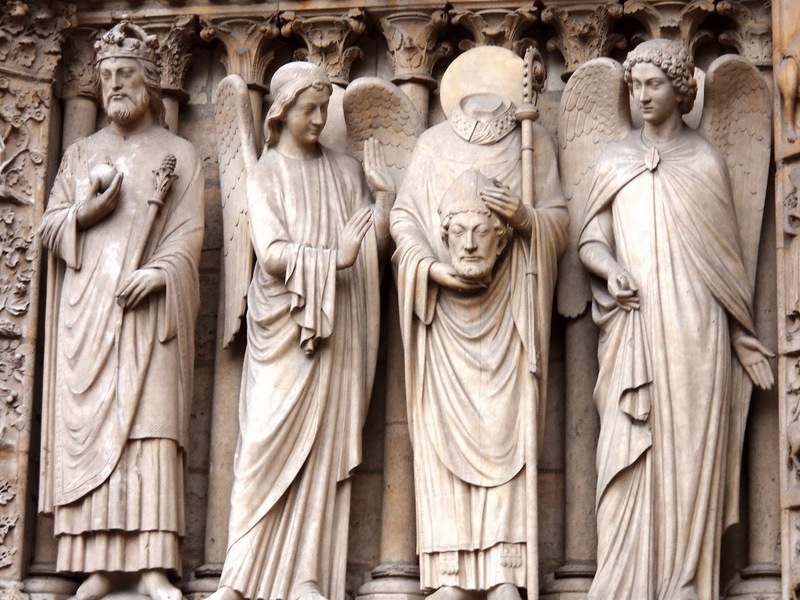 The building itself is amazing – you are immediately drawn to all of the incredible statues of saints and sinners that adorn it’s walls and buttresses (see picture right, click for larger). A man close to me said “it looks like the rain is gone” and his wife said “hallelujah”, and for some reason, I thought I could trust them to take my picture with my camera, so came up and introduced myself. They were really friendly, and we got a few good shots for each other in front of the massive Cathedral. A minute or two later, a lady came up and asked if I spoke English, and when I said yes, she held up a weird sign talking about how she was from Bosnia and had all these kids to take care of blah blah. She looked like a stereotypical image of a gypsy and I was immediately on guard. I knew something was up here – why not just talk to me if you spoke English too? And if not, how did you write the sign in English? She kept getting closer, and I laughed and said “sorry honey, my pockets are zippered closed” and walked away – she looked a little stunned at being found out, but quickly scurried on to the next sucker. And to think she was trying to pickpocket me in front of a Church! I followed a big group of what sounded like Italian-speaking people into the church, and heard the massive bass of the pipe organ playing as my eyes adjusted to the darkness for about a minute or two before it stopped – it was really amazing to hear it! And for the next hour, that was the only time it was played, so it was a real treat. I caught some of it on video to capture the sound. I spent about the next hour walking around and looking at statues of Archbishops and others who were buried within the walls, and spent a bit of time at the front altar of the church. 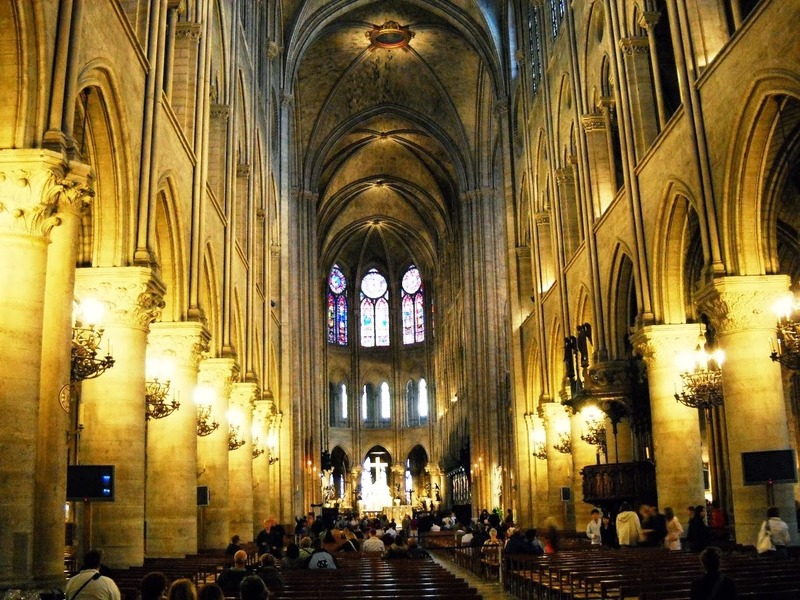 I have to admit, not being Catholic, that the Cathedral, beyond its architecture, wasn’t of much interest to me anymore, and it was unbelievably crowded. Big tour groups of Italians (not sure why there were so many) were literally filling all of the corridors to the point you couldn’t walk around them. I was starting to feel claustrophobic, so decided to get back outside. 11:30 AM – I crossed back over the bridge and away from the crowds, to get a few pictures of the backside of the Cathedral (see picture left, click for larger), and got some nice shots. The rain clouds seemed to be getting darker and closer as time went on, and I was getting concerned that my whole day was going to be wrecked. It was by no means hot outside, but whatever, I wasn’t going to quit unless it literally was pouring. 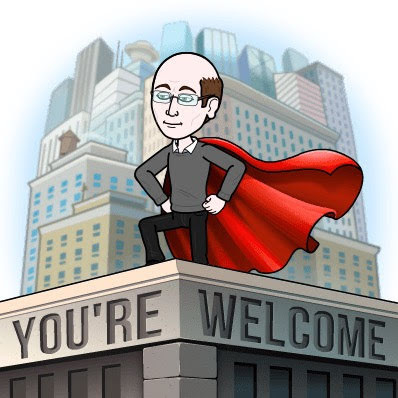 I made a call to the tour group I was going on tomorrow, and I’m glad I did – found out that the Metro stop they had stated in the brochure was best to go to (Palais Royal/Louvre) was in fact a 10 minute walk. I needed to go to Tuileries station, and it was only a 2-minute walk. I was to look for a courtyard with a gold statue, and the Cityrama office was apparently right there. I found out I was confirmed for tomorrow morning and was to be there at 6:45 AM. I’m getting excited now – hope the weather improves! 11:45 AM – Found a great little souvenir shop and spent about 20 minutes finding some Eiffel Towers, keychains, etc. for folks, friends and work colleagues back home. In hindsight, it wasn’t the smartest thing I did all day, but stuff was cheap. Now I have to haul it all around with me! I have a schedule to keep and I don’t want to go all the way back to the hotel to drop stuff off, but was tempted to after I carried everything out. 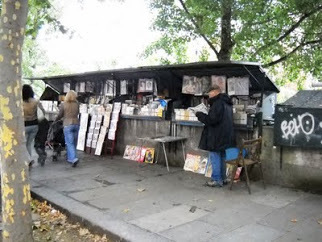 I was walking up the street, parallel to the Seine River, and saw a few little booksellers (see picture right, click for larger) that I’d read about that were open and selling things. Apparently, they have been doing this exact same thing for over 400 years in this area. The booths almost look like big green garbage bins – they flip open a lid that’s locked down to the street and up pops a bunch of tables with books, etc. on them. In case you are tempted to bypass this area of the city as being cheap tourist junk, think again. These are real genuine antique bookstore owners who sell some amazing nostalgic stuff – I bought a bunch of litho copies of a painting of the Eiffel Tower for people back home, and continued to head down the street back to the Metro. 1:15 PM – To get the to the Louvre, I had to first transfer to the Châtelat Metro station. I got on the RER B train and was there in just a few minutes. I was stunned at how enormous this place was – it is clearly the Grand Central Station of Paris. It’s named after Grand Châtelet – a castle destroyed by Napoleon in 1802 after the Revolution. It was so big it had about 6 or 7 stores in the main atrium area, which was like the spoke of a wheel, with all the corridors leading down to the various trains branching from it. This particular station is the connector for 7 Metro stations and 4 RER stations, and was already incredibly busy. I had to walk all the way down from one end of the station to another, which according to Wikipedia – is more than 1 kilometre long! 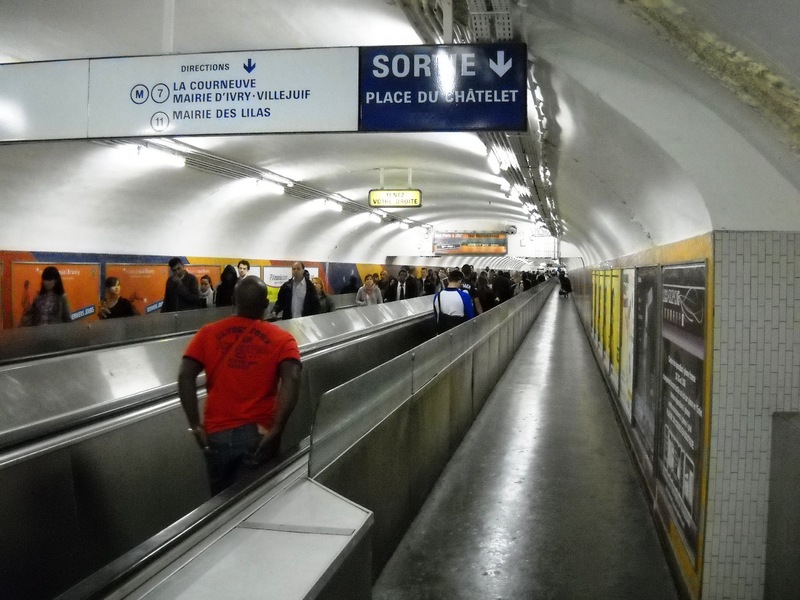 In fact, I had to go down two different moving sidewalks (see picture right, click for larger) to get to the last platform for Line 7 – which was to take me to the Louvre Metro station. It took nearly 15 minutes to walk all the way through the station, getting lost a few times and finally getting on Line 7 train, which is again one of the little LRT style trains that are so old and over-used. 2:00 PM – after about a 20 minute ride, I was at the Louvre station, and exited to a beautiful art deco exterior which I had to stop and take a picture of (see picture left, click for larger). I was clearly in the artsy section of the city. It was located in a little park, that had a comedy theatre beside it. When you exit the station, you come up into a little square, with the Hotel du Louvre behind you, something like looked like an embassy to the left, an antique mall across a little courtyard, and to the right, the magnificent, several-block-long Musee du Louvre. 2:50 PM – I spent a bit of time wandering around the neighbourhood, which seemed to be full of people but empty of sights, so I walked back to the courtyard, walked up to the Louvre. There was a walkway that went through the outer ring of the Louvre to the inner courtyard and main entrance. As I did, I walked by huge floor to ceiling windows that were showcasing some beautiful sculptures and statues inside. I wasn’t planning to go inside the Louvre at all, because I had a lot I wanted to do today, and I wasn’t really into art to that degree. But this was a neat little treat (see picture right, click for larger). Musée du Louvre or officially the Grand Louvre — in English, the Louvre Museum or Great Louvre – or simply “the Louvre” — is the largest national museum of France, the most visited museum in the world, and a historic monument. 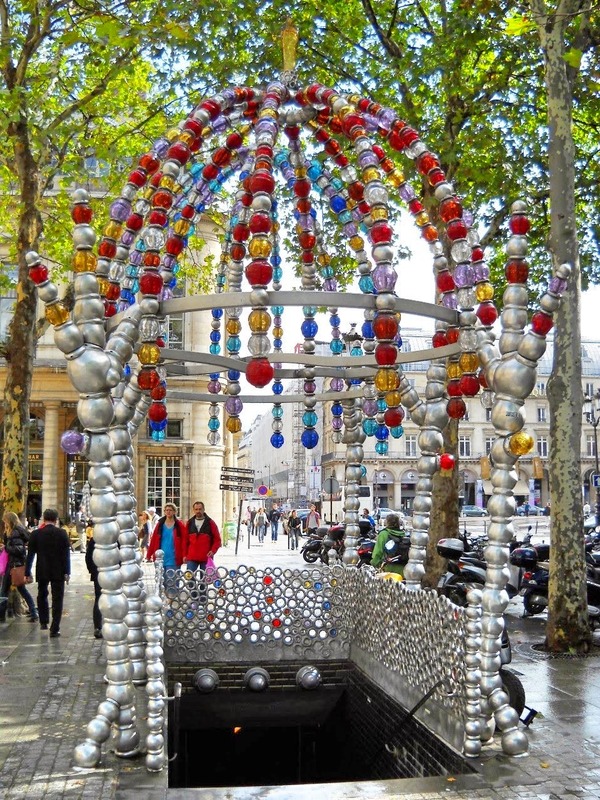 It is a central landmark of Paris, located on the Right Bank of the Seine in the 1st arrondissement (neighbourhood). Nearly 35,000 objects from prehistory to the 19th century are exhibited over an area of 652,300 square feet. 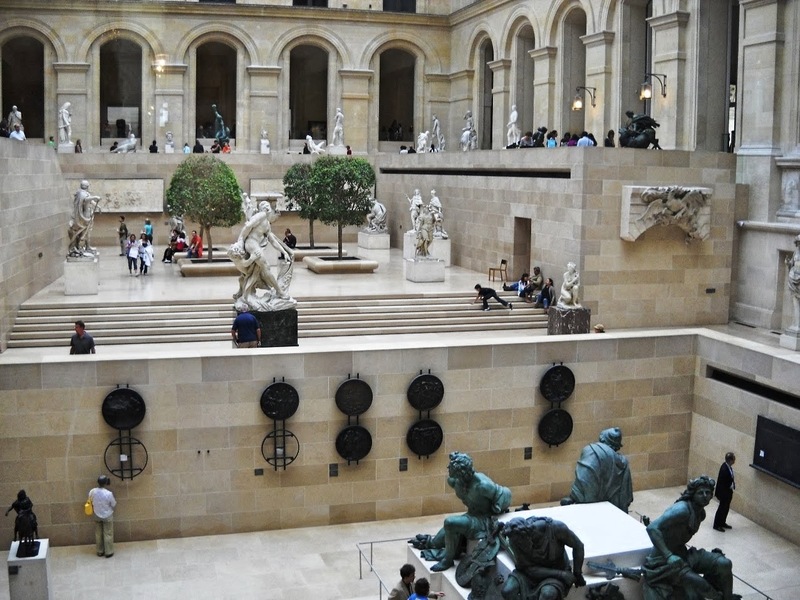 The museum is housed in the Louvre Palace (Palais du Louvre) which was a fortress built in the late 12th century under Philip II – and parts of the fortress are still visible. In 1672, Louis XIV chose the Palace of Versailles for his household, leaving the Louvre primarily as a place to display the royal collection, including, from 1692, a collection of antique sculpture. During the French Revolution, the National Assembly decreed that the Louvre should be used as a museum, to display the nation’s masterpieces. The museum opened on 10 August 1793 with an exhibition of 537 paintings, the majority of the works being confiscated church and royal property. The size of the collection increased under Napoleon when the museum was renamed the Musée Napoléon. After his defeat at Waterloo, many works seized by Napoleon’s armies were returned to their original owners. As of 2008, the collection is divided among eight curatorial departments: Egyptian Antiquities; Near Eastern Antiquities; Greek, Etruscan, and Roman Antiquities; Islamic Art; Sculpture; Decorative Arts; Paintings; and Prints and Drawings. 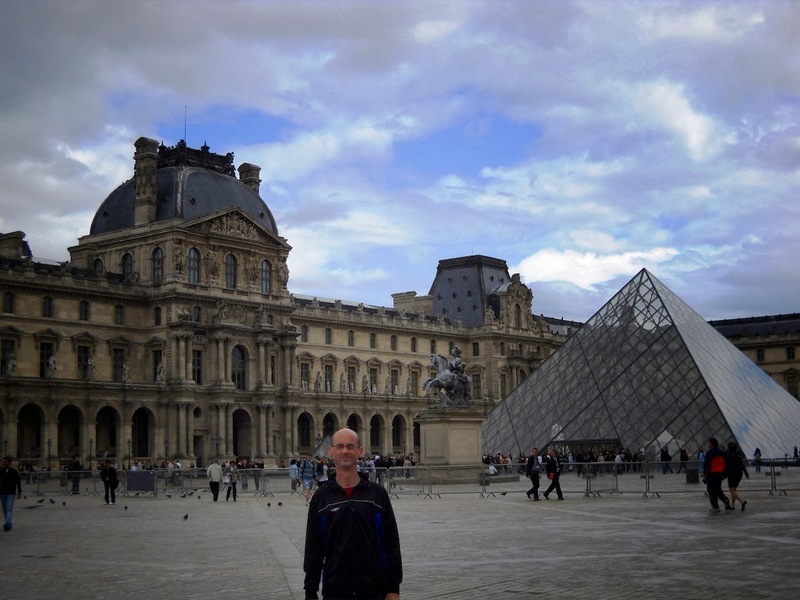 3:00 PM – I exited into the inner courtyard of the Louvre, which features the Pyramid. Suddenly the sky’s opened up and it just started pouring rain. The courtyard had been just full of people and they scurried to all sides of the courtyard to escape the rain, including myself. I hadn’t brought an umbrella because I didn’t really think it was going to rain in the afternoon – this sucked. I thought it would last forever, but a major wind came up out of nowhere all of a sudden, and within minutes the sky’s temporarily cleared – long enough for me to a get a few dismal shots in front of the Museum. Sigh. 3:30 PM – soon it started to rain again, and I lost patience. I was tired, had been hauling the souvenir bag around for hours and was ready now to get back to the hotel. I had actually had seen most of the sights today on my list. I crossed the street back to the courtyard, and walked down a block-long area with souvenirs, restaurants, etc. It was crowded, noisy and irritating. 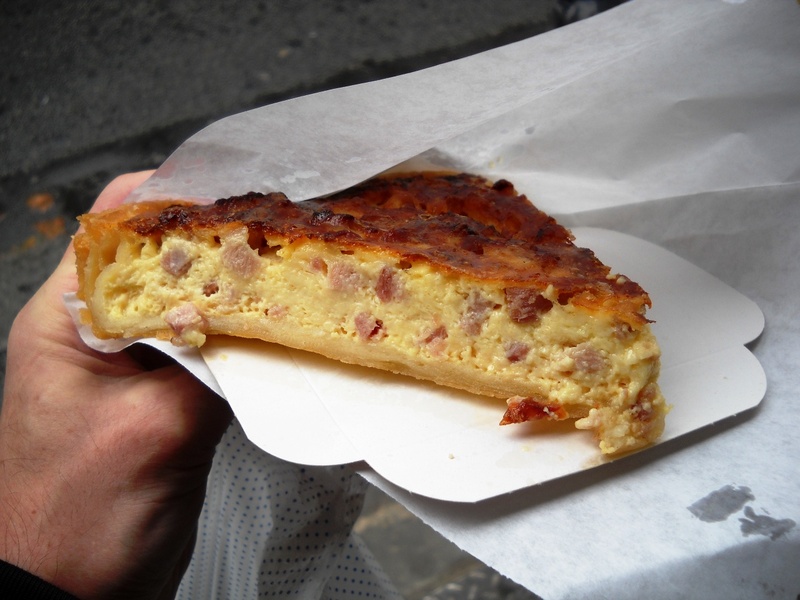 I came up to a restaurant called Rivoli Cafe and bought a quiche that looked like a pizza (see picture left, click for larger). It was really quite awful – very greasy, but it was only about 2,50€ so I couldn’t resist. I was pretty irritated to see a McDonald’s a block away, however – I should have eaten there instead. I was already feeling a bit upset before I even left the area. Then I had an extremely irritating follow-up trying to find a bank or currency exchange that would break my 50€ bills, because they were sticking up outside my wallet, advertising to everyone who wanted to see, and made me nervous. First I went to two different currency exchange places, and asked where a bank was at both. Both said they didn’t know where one was. Turned the corner, there was a bank. Good lord. I waited in line at the bank for over 20 minutes and they wouldn’t break my bill, and the currency exchange places wouldn’t either. One actually told me to go to a supermarket and buy something. I told him to drop dread and stormed out. 4:04 PM – This was the Paris that sadly many warned me about – ignorant, unhelpful, rude barbarians. But I do not believe these are true Parisians, just as I don’t believe this tourist nightmare is a real cross-section of the wonderful city. I admit I was starting to get really sick of the city at this point, and wanted to go home, but knew I was just overreacting and tired, so headed back to the hotel to relax before heading out tonight. As I left the area of the Louvre, it was really starting to rain again by now, so I was getting discouraged that I wouldn’t get to go out tonight, but I was going to go on the boat cruise whether it was nice out or not. ©2008-2018 Calling Out Community. Ready and Steady...Until He Comes™ In 2015, Shawn Jorgensen founded the Calling Out Community - a counter-culture collective of conservative bloggers, utilizing every social media platform possible, to fulfill our mission to bring together like-minded conservatives from around the world to discuss pressing issues, and share real-world stories that the liberal leftwing bloc - individuals, corporations, governments and mainstream media outlets - don't want you to know about. However, before the Calling Out Community began, he had published a series of three travel blogs of his adventures in: Sydney, Australia (August 2008) Boston, USA (May 2009) Paris, France (September 2009) These blogs are now available to Calling Out Community readers for the first time ever - having been moved from their previous home on Blogger. We think you will enjoy them, for though they are a decade old, most of the information is still usable today, and the perspectives are definitely timeless.